Roald Dahl. The Minpins. Illus. Patrick Benson. London: Jonathan Cape, 1991. Print. I promised you all that I would review three Roald Dahl books that are often overlooked. Therefore, I will be reviewing The Minpins today. Little Billy, like most children, is constantly being told by his mother what he can and cannot do. For instance, he is not allowed to go into the forest behind his house. His mother calls that forest the Forest of Sin, and claims that there are dangerous monsters living there. But one day, Little Billy succumbs to the temptation of the Devil and enters the Forest of Sin. Upon entering the forest, Little Billy is chased by a bloodthirsty, fire breathing monster called the Red-Hot Smoke-Belching Gruncher. 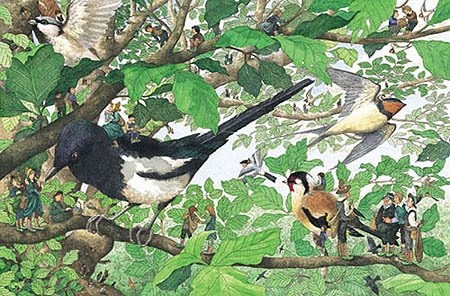 He climbs a tree to escape from the beast,and meets the Minpins, small people who live in the trees and travel by bird. Little Billy goes on an adventure that he will not soon forget. The Minpins live in the trees. There is a large tree near my apartment that has a huge hole in the bark. I have often imagined what it would be like to live inside the bark of a tree. Patrick Benson’s illustrations are gorgeous. As much as I love Quentin Blake, I do not think his illustrations would be appropriate for The Minpins because Blake excels at character drawings. Little Billy, the Minpins, and the Red-Hot Smoke-Belching Gruncher are extraordinary characters, but Benson’s illustrations emphasize the forest environment. I honestly felt as if I too was going on an adventure in the forest. At the risk of being called a prude, I am going to confess that I did not like that the forest was called the Forest of Sin, and that the Devil tempted Little Billy to enter it. I have always appreciated the darkness that Dahl includes in his children’s books. Children can handle it. Much of the humor in his works would be lost if there was not darkness. However, The Minpins toys withe the Devil and sin, and I just couldn’t prevent my Catholic sensibilities from flaring up. What bothers me is that not everything in the Forest of Sin is dark and dangerous. Rather, the Minpins are delightful creatures. Dahl has often been able to tow the line of what is appropriate and inappropriate for children, but I feel that in certain parts of The Minpins, he crossed that line. In this story, the author was definitely bringing into question the notion of sin. Maybe sin isn’t that bad. Maybe sin is just something parents have made up to get their children to obey them. It is acceptable to entertain such questions in a book for an older audience, but it is distasteful to bring up these questions in a book that is written for primary school children. What do you all think? Did Dahl cross the line, or am I being too sensitive? The Giraffe and the Pelly and Me is another of Roald Dahl’s lesser-known works. I dare any reader to find something ordinary about the characters or the plot. While an older audience would prefer multidimensional characters, young children prefer caricatures. Dahl knew that. I couldn’t stop smiling and laughing as I read this book. 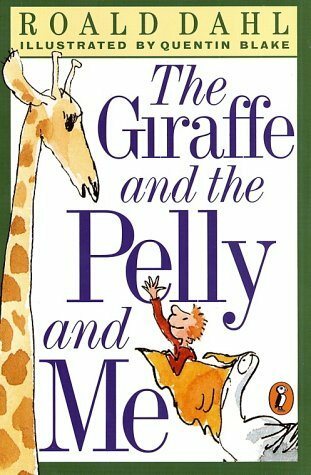 When the ordinary world ceases to be exciting, there is always the world of The Giraffe and the Pelly and Me. In such a world, children can be business managers and are respected by notable adults like The Duke of Hampshire. But behind this fantastic plot is the message that everyone – even those who may seem odd – are indispensable to society. At first glance, the Giraffe, the Pelican, and the Monkey seem out of place in a city. Yet, they perform window cleaning services that others can’t perform as well or as efficiently. I am not ashamed to say that Roald Dahl is my all-time favorite author. He is certainly one of the greatest children’s authors of the 20th century. In the next few posts, I will review some of Dahl’s lesser known books for children. Mr. Hoppy, a gardening fanatic, is madly in love with Mrs. Silver who lives on the apartment floor below him. But Mrs. Silver seems to be oblivious to Mr. Hoppy’s love for her. When she is not working her 9-5 job at a newspaper store, she is doting on her pet tortoise. Mr. Hoppy is too shy to tell Mrs. Silver that he loves her, so he comes up with a plan to win over her heart. You can learn more about Roald Dahl’s writing by going to the official Roald Dahl website. Under the link “The Man”, you can listen to him answer a series of interview questions about his writing schedule and inspirations.